A beautiful addition to any bedroom. In antique white. This gorgeous French inspired bedroom range, brings a sense of style and luxury to any bedroom. 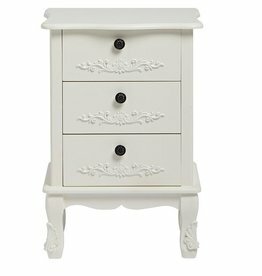 This range is elegant and timeless with its intricate ornate detail, creating that perfect Boudoir feel. 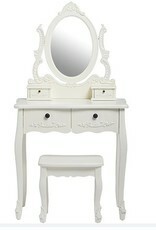 This range comes in the ever popular antique white and the new on trend colour, black. Please note: Delivery for this item will be 3-5 working days. 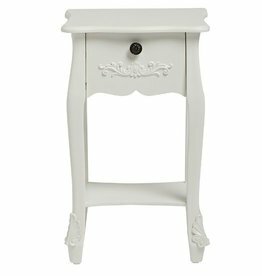 French one drawer night stand. 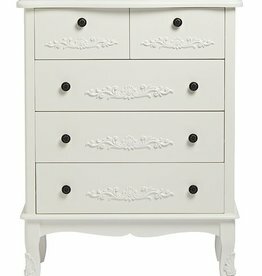 French Tallboy, features 5 drawers. 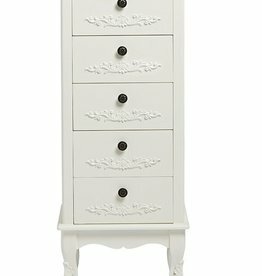 French 5 large drawer chest.